G-SHOCK, which has been constantly pushing the limits of timekeeping toughness since 1983, is pleased to announce a new SHICHI-FUKU-JIN (Seven Deities of Good Fortune) Series of special model watches. The Daikokuten Model of the seven models in this series is based on the GX-56, which is designed and engineered to stand up to impact from any direction. A two-step urethane bezel combined with an inner protector for the ultimate in shock resistant construction. The inner protector also has αGEL at 3, 6, 9, and 12 o'clock, for outstanding shock resistance. This structure ensures that impact is blocked at multiple layers so it even if it is transmitted into the case, it does not reach the module itself. The design of this model is robust and intrepid, molded into a powerful looking form. Basic black coloring is decorated with khaki accents that further accent a look of power. 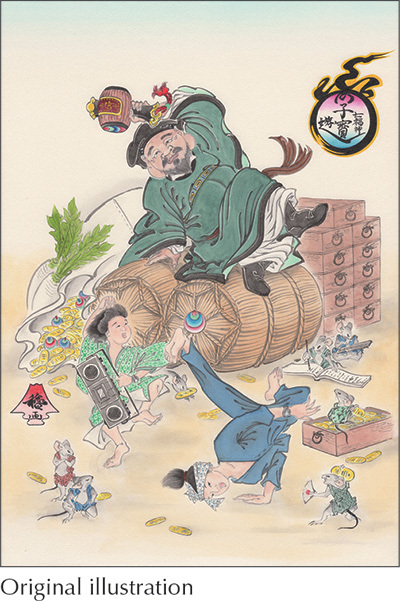 The band is decorated with an uchide no kozuchi (mallet of fortune) and mouse, while the band ring is imprinted with koban (oval gold coins), which are images of the god of prosperity. Function-wise, this model features a Tough Solar power system and a host of practical features and functions. 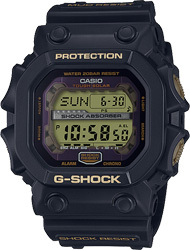 Illuminating the display causes the letter O of the G-SHOCK name to float in the EL backlight glow. Each of the Seven Deities of Good Fortune models displays a different character that together spell out the name G-SHOCK. The Seven Deities of Good Fortune represent a blend of indigenous Japanese religion and Buddhism into a uniquely Japanese belief. This divine group consists of the seven gods named Ebisu, Hotei, Benzaiten, Bishamonten, Daikokuten, Jurōjin, and Fukurokuju. These deities have their origins in ancient gods of fortune in Hinduism, Buddhism, Daoism, Shinto, and other sources. According to the Humane King Sutra (Humane King State-Protection Perfection of Wisdom Sutra), paying homage to these deities will serve to avoid seven misfortunes and be blessed with seven fortunes. * This belief began around the end of Japan's Muromachi Period. It became a popular belief among common people during the Edo Period, and has been handed down to modern times. Daikokuten is called a Shiva incarnation of Hinduism, and made a syncretic fusion of Shintoism and Buddhism with Ohkuninushi-no-Mikoto in Edo era. He has a big bag on his back, a mallet of fortune in his hand and put a hood on, and such his style is generally well known. He has faith widely as the God of fertility who holds the earth and foods. Copyright © 2003-2019 Javy's International Ltd. All Rights Reserved.